Neuroscience, psychology, meditation, life coaching and positive psychology. The course will break through your limiting beliefs and guide you in achieving your 2019 goals! Picture your ideal future self - living your best life. This 10 day program will offer a simple way to change your life for more calm, happiness and success this year. How this vision board program will help you achieve your goals? What EQ’s vision board program can do for you? 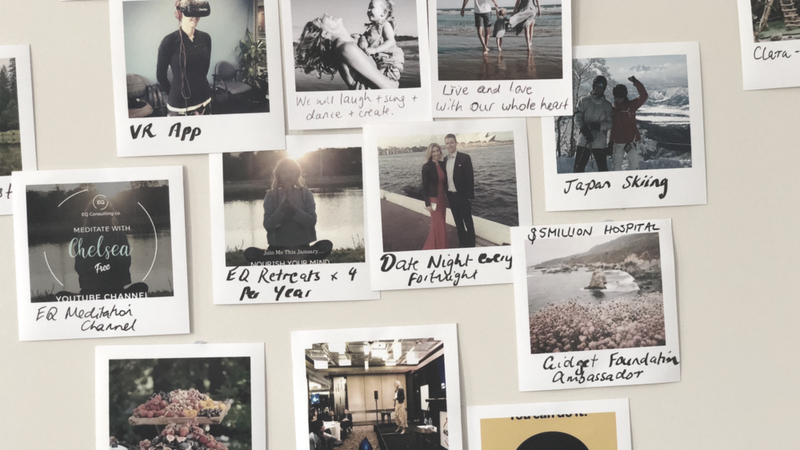 Who is EQ’s Vision Board Program for? Chelsea is an international speaker, a proud ambassador for mental health charities including R u Ok? and The Gidget Foundation and an authority on Mindfulness and productivity for the corporate world. For 12 years Chelsea worked in the corporate world. Then a life adversity happened. After her life reboot, Chelsea embarked on a PHD in psychology and neuroscience and became the poster person for mental health and mindfulness in Australia. She works with companies like uBer, eBay, Cook Medical, Westpac and Mercedes-Benz to name a few and is regularly featured in Marie Claire, Women’s Health, UK Daily Mail, Channel 9, ABC News and 2DayFM. Why Chelsea supports vision boards? My sceptical mind tells me that there is a rational explanation for every piece of life’s events as they are unfolding. In 2017, I had a talk to a professor at University and we were discussing Quantum Physics, neuroplasticity and the power of visualisation. Biography’s I was reading, I.e. Oprah Winfrey does it. Perhaps, I should try it…. So, up went my polaroid images, and I started practiced the techniques I was learning at University. Meditation, visualisation, journaling, practicing intentions, utilising imagery and the power of a positive mindset. One of my images was of The Gidget Foundation that has a target of $5M underneath. My dream is to build a public hospital for Post Natal Depression and Anxiety patients in Sydney, Australia. In 2 weeks, I just happened to be introduced to a friend, who at the exact time was hiring a CEO for The Gidget Foundation. Whom, just happened to be looking for an ambassador for this charity. She just happened to be in conversations with our government, who had just happened to have a new focus on mental health. The government just happened to then donate 300k to The Gidget Foundation. Was it was all a matter of random chance? But after months of similar experiences happening in my life, my sceptic mind began to think again. How can so many highly unlikely things come together at once to produce a desired result? This led to a mission to determine if there is a scientific link between how we think and things that materialise. If I was to treat vision boards and visualisation as a scientist rather than a hypothesis. Would it stand up? I began my research and addressed this question in my follwing vision board program. With incredible excitement, I realized that the evidence is there. But no one strung it together from a clinical perspective. This program will astonish you. You will uncover as your consciousness changes, so changes your world. Chelsea’s Vision Board Program is one of the most needed, important and captivating programs I have ever done. Everything that has recently turned up in my life, is here because it started as an image in my mind. + How long does the course take? The vision board program is 10 days. Each day includes a short video, guided meditation, journal prompts and a 10 minute podcast. The minimum time commitment you can plan for is 20 minutes per day. It is entirely aimed at being self-paced and you will get a lot of support in our Private Community Group. + What is included in the Vision Board Program Private Community? The Vision Board Program private community is a closed Facebook group managed by Chelsea and EQ’s amazing team. You can share your dreams and goals with us here, find support from like-minded people and no question goes unanswered. + What materials will I need to take this program? Everything is provided in this course. All you will need is an open mind. + What vision board will I have in the end?